Iranian Persian Nain Rugs – Nain is a small village located in central Iran that has relatively recently become a renowned center for carpet weaving. Production began here in the 1930’s. Although Nain rugs are not as old as many of the traditional Persian rugs, they retain their value in terms of construction. These rugs are often grandiose in scale, many exceeding 25 feet in length. They are also exquisite in design due to their use of silk in weaving both the foundation and fine pile of many rugs from the area. 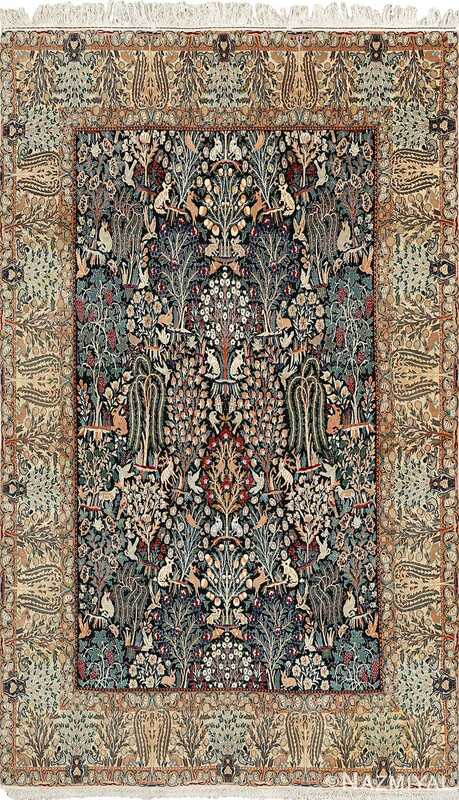 Though located not far from Isfahan, Nain was not involved in rug production until the period between the two world wars. 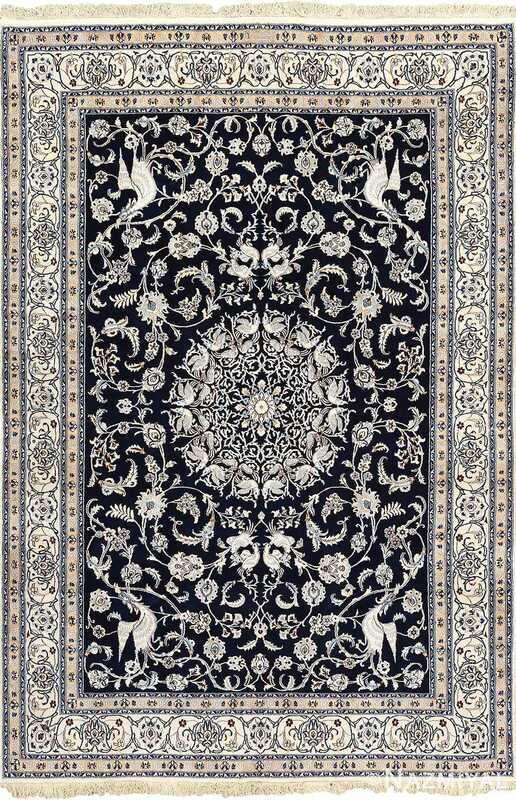 Though it started late, Nain rapidly achieved prominence for the production of rugs in the classical tradition of nearby Isfahan, generally with medallion designs. But with knot counts of more than 800 per square inch, Nain rugs soon became almost legendary for their exceptional fineness. The pile of Nains is almost always of rather soft wool, although they make distinctive use of ivory silk to outline the various forms of the design. More recently, they have begun to use silk for the warps, and one may come across the occasional all-silk Nain as well. 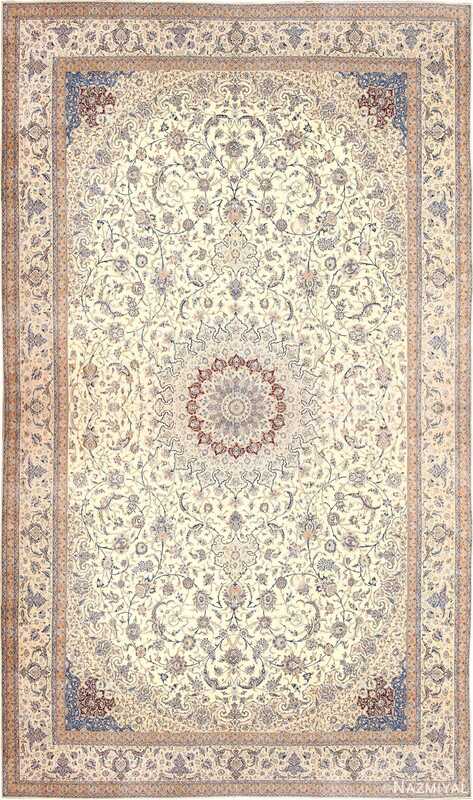 Since not many of them were ever imported, Nains are among the rarest Persian rugs in the United States. 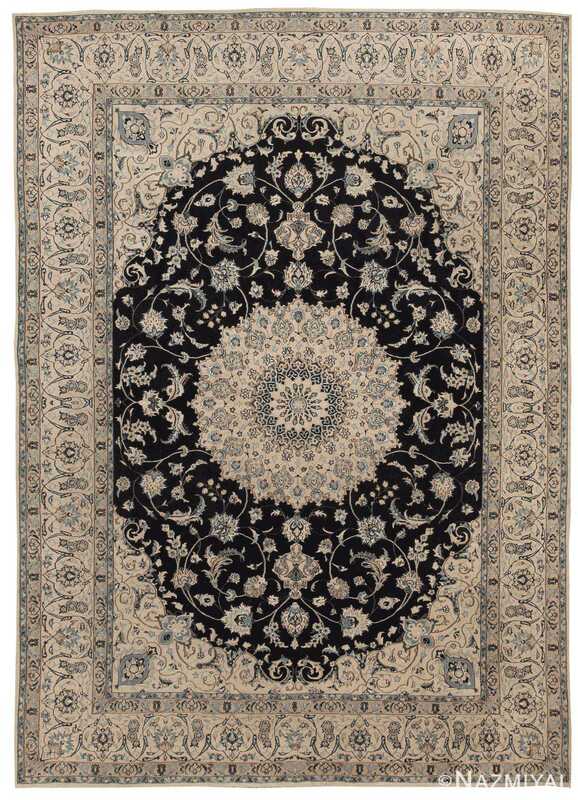 Woven by skilled artisans, Persian Nain rugs are highly sought after. They are made with beautifully muted colors, predominantly beige and navy. Light blue, burgundy, and green are used occasionally. They are woven using the Persian knot. Iranian Nains usually have a cotton warp, however sometimes silk warps are used. The pile is characteristically wool, but weavers may use silk or accent with silk. A featured characteristic is the centered medallion, which is at times adorned with floral motifs and animals, mostly birds. The standard used to determine the quality of a Nain rug is the measurement of LAA, the number of threads forming each fringe at the end of the rug. They are exquisitely woven with the Persian knot, with an average of 300 knots per square inch. The higher the knots per square inch and the lower the LAA, the higher the quality and the price of a Nain rug is. 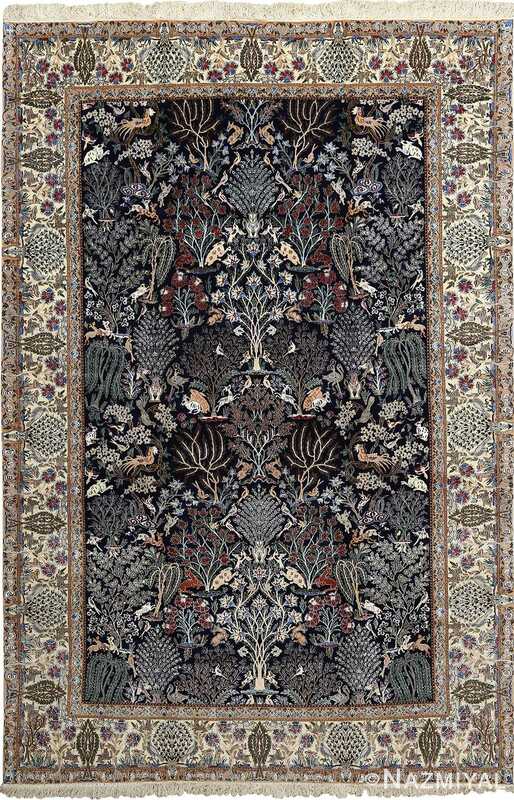 Iranian Nain rugs are created in Iran in the town of Nain or in nearby areas. 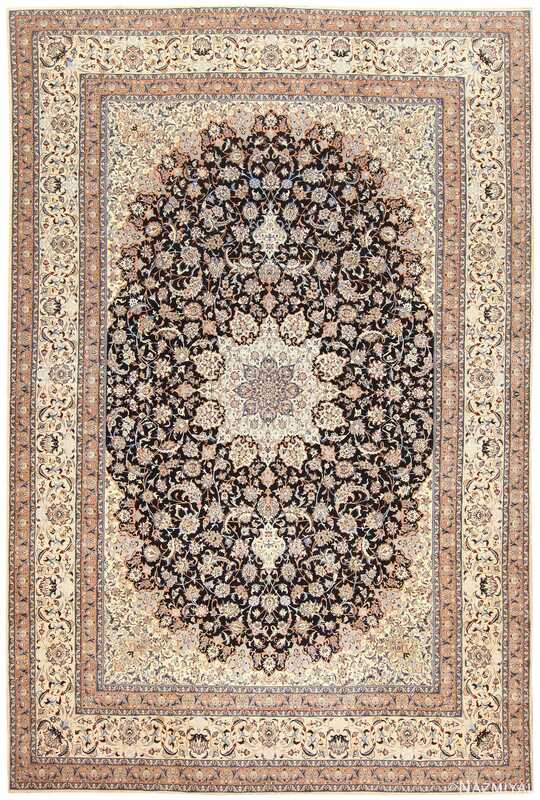 Style and design of the Nains is heavily influenced by the Isfahan weavers, but they are easily distinguishable by the colors used. 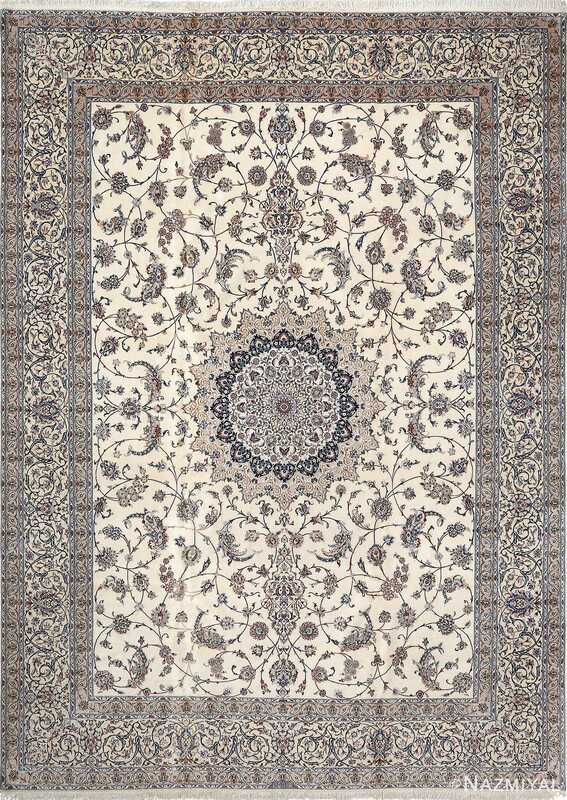 Elegant and understated, the Persian Nain rug is highly desirable and a testament to the craftsmanship of the area.